The Apple Heart Study — which began enrollment at the end of November — has now begun data collection, with participants receiving prompts over the weekend to sign informed consent documents and initiate data collection. That document also reveals some new details about how Apple plans to use data collected during the study. “This study is part of the development of a new investigational device and certain Study Data will be used for FDA submission to seek approval of the investigational device,” the document says, under a section labelled 'Commercial Gain.' "The Sponsor has no plans to offer you any financial compensation or share any profits from the commercialization of any products, processes, or services developed from your Coded Study Data, as described elsewhere in this consent. You will not, however, lose any legal rights to which you are entitled by participating in this study." When Apple announced the study, which is being conducted in collaboration with Stanford Medicine, Chief Operations Officer Jeff Williams said that launching the study had involved conversations with the FDA, but didn't elaborate on the point. This document is the first confirmation from the tech giant that the study data will be used — or at least could be used — in the development and approval of an FDA-cleared product. It was confirmed that the product in question is not a new hardware product (for instance, a competitor to AliveCor's KardiaBand). 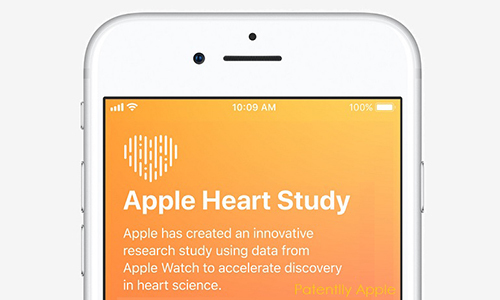 Instead, the investigational device referenced is the study app itself including, presumably, the algorithms for detecting irregular heart rhythms using the Apple Watch's sensors. Elsewhere in the document, Apple states that "Your Coded [de-identified] Study Data received by the Study Sponsor may be used for the purposes described in this consent document, including determining if sensor data can be used to identify irregular heart rhythms and for the development and improvement of said detection mechanisms evaluating heart rate variability across populations and at various activity levels, and for health-related product development and improvement activities." Apple has a considerable amount of history with the FDA, especially for a company that has not, to date, actually secured an FDA clearance or directly marketed an FDA-cleared device (numerous FDA-cleared devices and apps from third parties have been sold in Apple's physical stores and app stores, but nothing from the company itself). Apple's previous conversations with the agency, request and published in 2016 by FOIA, detailed plans for "two possible (and related) products in the cardiac space," per Robin Goldstein, at the time principal counsel for Apple. The same report detailed Apple's involvement in the creation of the International Medical Device Regulators Forum's Software as a Medical Device (SaMD) guidelines, which would go on to form the basis of the FDA's own SaMD guidance. More recently, Apple surprised the industry by signing up to be a part of the FDA's Pre-Certification pilot, which is a program for companies that would like to expedite the clearance of future medical devices through the agency. Copyright©2019 Ddu. All rights reserved.